Can you believe we are more than 2 weeks into 2019 already? Who’s still writing 2018 on everything? How many of you are still working on your New Year’s Resolutions? I am happy to say that I am. Although, I didn’t really make resolutions. I made lists. I joined a few programs. I wrote down ideas. I call them my Non Resolutions. If I start to wander I can just jump back in. They are more 5 goals and/or changes, my 5 NON Resolutions. I made a list of how I wanted to spend my time. I have a hard time with time management so I spent some time reading articles on how to better spend my time. For me it is hard working from home, going to school online, and trying to keep the house in order while my husband works crazy insane hours, sometimes all night-ers followed by all day, and often a few hours from home. It makes it hard to plan meals, go to the gym together, and even consistently go to church. My NON Resolution solution: Working in time blocks. I block out about roughly 3 hours a day to work on schoolwork, 4-6 hours a day for work, an hour for the gym, and an hour for house cleaning. Sometimes the house cleaning doubles as gym time depending on what I am doing (did you know you can burn almost 250 calories running the vacuum for 30 minutes?) and sometimes the house cleaning is nothing more than 15 minutes doing the dishes and scooping the litter box. Sometimes my schoolwork is done and I can spend more time on house cleaning. (see below) I have found that setting a timer is helping me stay on track. I plan my time blocks usually the night before in my planner. Speaking of my planner, I bought a new one this year, a physical one. One that I have to physically write in, with an actual pen, not a keyboard. I still have everything in my Google Calendar as well, but that is more useful for Mr. Beet, who can see what plans we have as he tries to plan his work schedule. 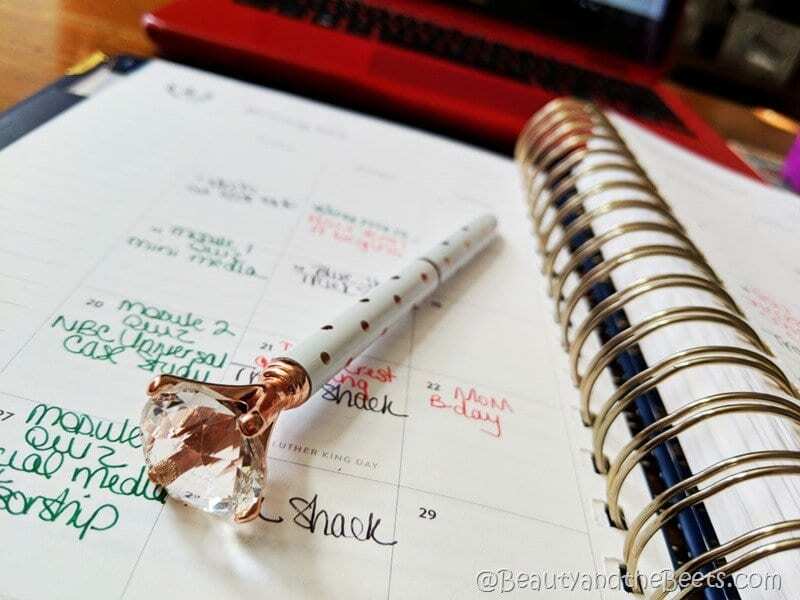 I love my planner from Emily Ley (you can get it here and here) and my diamond pen (from Amazon here). 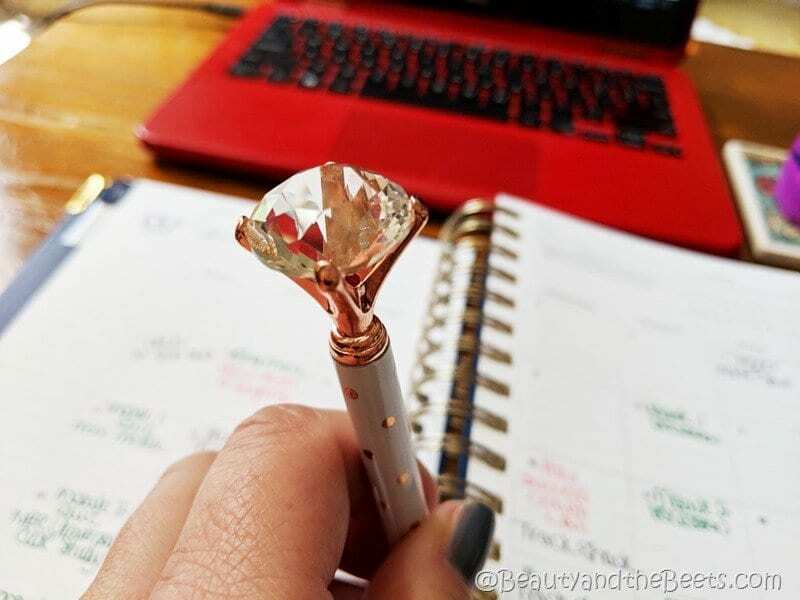 How can you feel blah when you are writing with a giant diamond pen, am I right? It makes planning fun! About once a week I have more time to devote to house cleaning, I will set my timer about 3 hours and start de-cluttering an area of my house that is in desperate need of organization, like the linen closet, or under the bathroom sink. Let’s just say I don’t need to buy shampoo or face wash for the next 5 – 10 years. I had no idea I was such a hoarder. Mr. Beet and I are also trying to par down our possessions as we are looking to move into a new house soon. OK, so this one is kind of a resolution but also a NON Resolution. I am not trying to lose a specific number of pounds, I am not trying to run X number of miles a week, or go to the gym 5 days a week. I am just trying to feel better. About a year and a half ago, I had a major neck surgery that derailed my running life (and when I say running, I really mean mostly walking). As I sat in recovery, the weight began to pack on, and on, and on. To the point that I was finding myself winded. I was finding myself staring at a closet of beautiful clothes that I looked round and frumpy in. My NON Resolution solution: I joined two programs- one is a mindful healthy eating program, the other is a running group through my local running store. For the latter, we meet twice a week at a local park and spend an hour either running drills, walking, or running in loops. I am gearing up for my first major race since my surgery – the 2019 Gate River Run in Jacksonville. The second program I joined is called NOOM. (join here and get 20% off) The 16-week program is $149 and I have already lost about 8 pounds. Though the number is not my goal, I am feeling better already. Other people in the program do aim for a certain number on the scale – everyone measures success differently. I spend about 10 minutes in the program each morning learning about triggers, self-sabotaging behaviors, and how to eat better. I am eating foods that have a low calorie density and more importantly, I am eating more colors. As a general rule, the more colors you eat, the more nutrients you are taking in. I also weigh in each morning, which again, is not about the number, but the motivation, and I find that my eating is healthier as I keep track of everything I put in my body each day. I am more mindful of everything I eat. Nowhere in the program am I told to avoid sugar or not give into cravings. It’s all very interesting the psychology of it all. Like I said, two weeks in, I am down 8 pounds and my mindfulness is different. 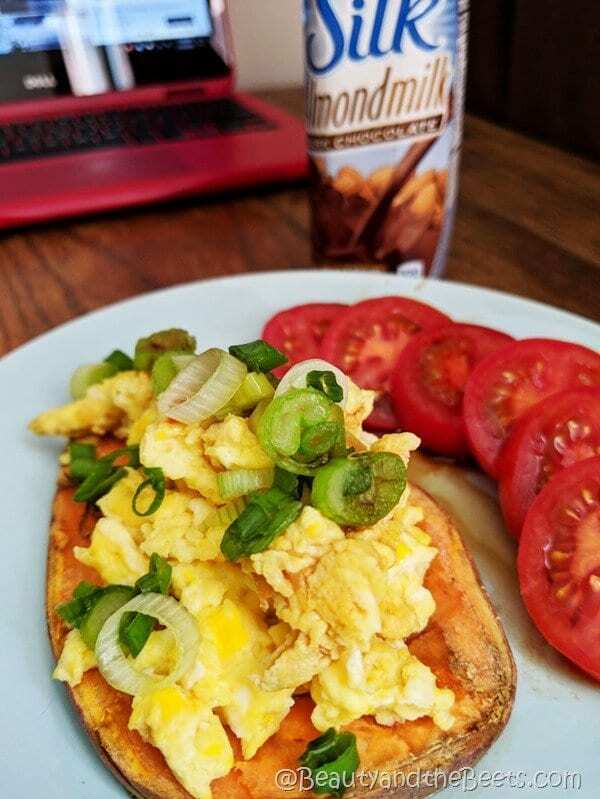 Here I have two easy ideas for breakfast – both are under 300 calories and healthy. I am not a Doctor, or a registered dietitian, I approximated the calories according to a calorie app I use. Post running or gym, I like to toast a sweet potato slice in the toaster (it’s that easy!) and top it with 2 scrambled eggs and sliced green onions. On the side I love ripe tomato slices drizzled with about a tablespoon of balsamic vinegar. I like to drink chocolate almond milk after my run for both the proteins and the carbohydrates. I love rice cakes. I love the crunch but they are not exactly the most filling of foods. 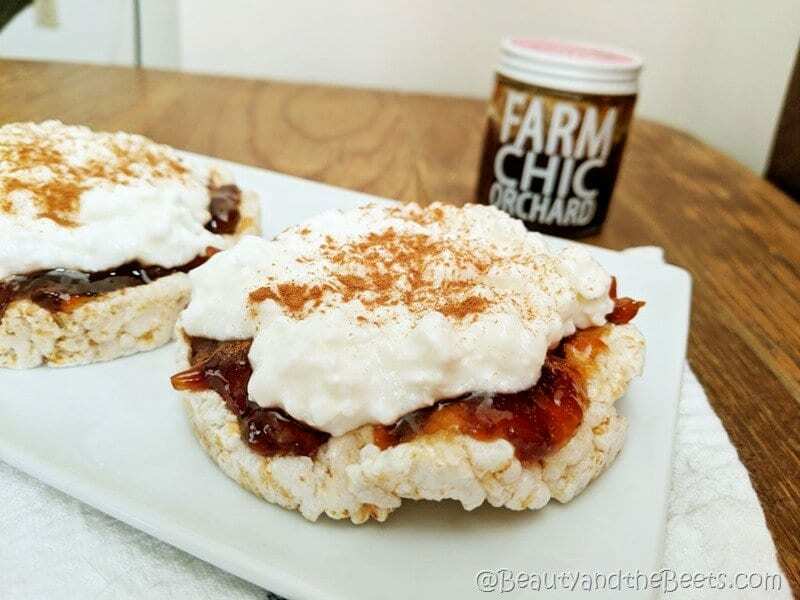 In the morning I will top a lightly salted rice cake with a tablespoon of plum jelly I picked up on a recent trip to California, 2 tablespoons of cottage cheese, a light sprinkling of cinnamon. This is another resolution I am dubbing a non resolution. 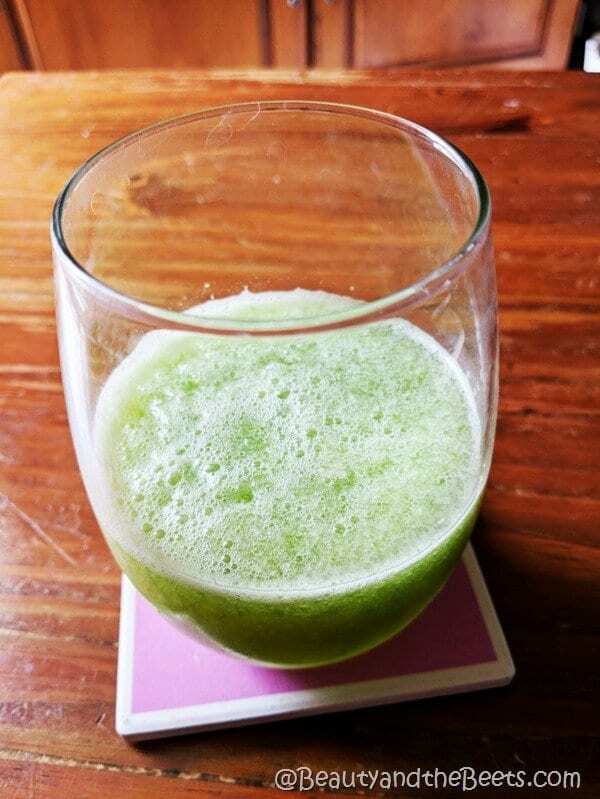 I am starting the day with celery “juice” – I blend one cup of chopped celery and 2/3 cup of cold filtered water in my Ninja blender, then drink it before I eat anything else. I get fiber from the celery pulp, and the celery juice is good for liver detox. There are many links to drinking celery juice and good health. And trust me when I say it is not as gross as people think it is. Do you have any resolutions or non resolutions you are trying this year?